Ethics statement: We used a pre-production S1 sample at a press event in Spain. This means that the specifications, settings and performance may vary once the finalised products hit the shelves. We tested the GH5 for a three-week period two years ago. Within the article, there are affiliate links. If you buy something after clicking one of these links, we will receive a small commission. To know more about our ethics, you can visit our full disclosure page. Thank you! 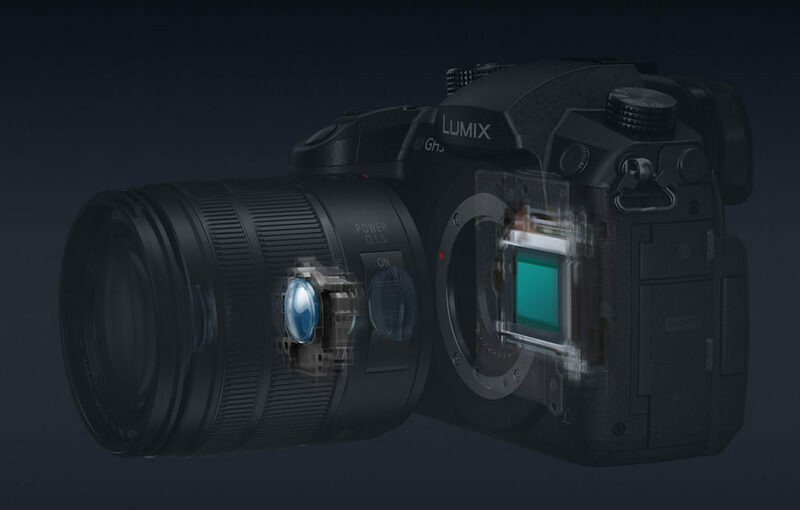 Up until recently, Panasonic had only one mirrorless system – Lumix G – which is based around the Four Thirds Live MOS sensor and Micro Four Thirds mount. As the name suggests, the sensor has a 4:3 aspect ratio. The GH5 is one of the flagship models within this range, and for this reason, it houses the latest 20.3MP chip with no low pass filter. The backbone of the Lumix S series is the larger L-mount, which was first used by Leica for the Leica SL, and the new 35mm full-frame CMOS sensor. It features 24.2MP and uses a 3:2 aspect ratio. It also lacks a low-pass filter. Although we haven’t performed any direct comparisons between the two models, it is safe to assume that the S1 will produce images with better dynamic range and less noise at high ISO levels. The S1 has a wider ISO sensitivity range than the GH5, with its native range of 100 to 51200 ISO and extended 50, 102400 and 204500 values. The GH5’s native range is limited to 200 to 25600 and the only extended value is 100. For video, the GH5 is even more restricted as the 25600 value disappears. When we tested the GH5, we found that the high ISO performance was quite clean up to 3200 and usable up to 6400. In extreme situations, 12800 allows you to bring home decent shots but noise becomes more invasive. We have yet to perform any definitive tests with the S1 but what we saw when using a pre-production sample was promising. For example it looked very clean at 10000 ISO for video. 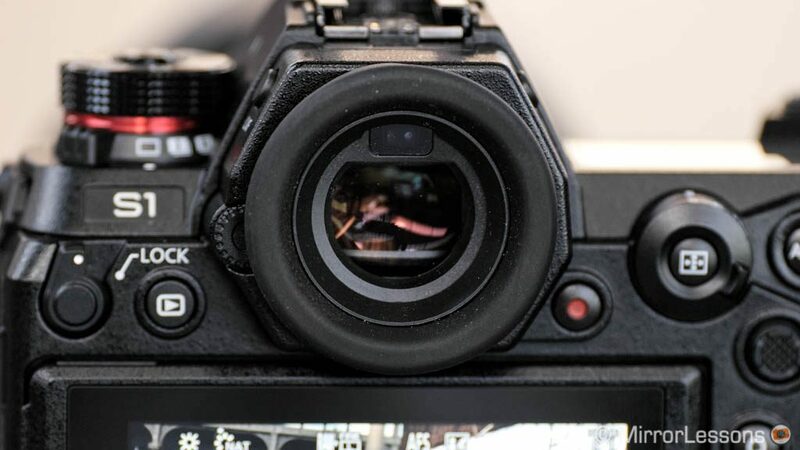 The High Resolution mode first appeared on the Lumix G9 and has since made an appearance on both the S1 and S1R. Taking advanced of the image stabilising mechanism, eight consecutive images are shot while shifting the sensor. These images are then merged into one by the new Venus Engine, producing a high resolution shot of 96MP. This mode is ideal for landscapes and still life with very fine details but isn’t particularly well-suited to scenes with moving subjects as motion blur can occur. That said, there are sub-options within the menu to suppress these artefacts, though it is yet to be seen how effective they are. The GH5 lacks this High Resolution mode and as such, is limited to 20MP of resolution. The S1 sports the world’s highest resolution electronic viewfinder whose 5.76 million dot OLED display and 10.000:1 contrast ratio ensure a clear and detailed view of your scene. It offers refresh rates of either 60fps or 120fps and a small lag of just 0.005 seconds. The finder magnification can be adjusted from 0.78x to 0.74x or 0.7x. 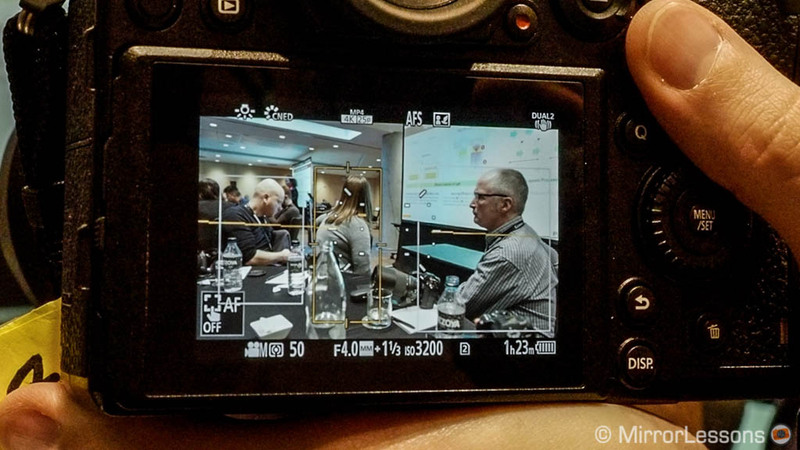 When we used the camera at the press event in Barcelona, we were very impressed by the quality. It is easily amongst the best, if not the best electronic finder we’ve ever had the pleasure of using. The GH5 also has a very good OLED display but the specifications aren’t quite as impressive. It offers 3.68 million dots, a 60fps refresh rate and only one magnification setting (0.76x). Another difference concerns the rear LCD screens. Once again, the S1’s display has a higher resolution (2100k vs 1620k dots) but even more importantly, it utilises a different tilting mechanism to the GH5. 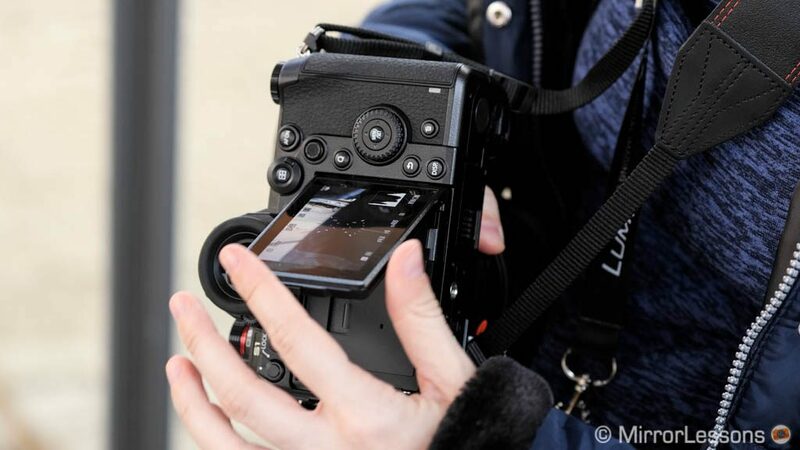 Whereas the Micro Four Thirds model employs a free-angle screen that flips out to one side, the S1’s is a tri-axis type that tilts up, down and to the side in a similar manner to the screen of the Fujifilm X-T2 and X-T3. Although not ideal for vlogging, Panasonic states it is a more robust solution – and a representative at the press event went as far as to dangle one of the cameras from its screen to demonstrate this! Both screens are touch sensitive and can be used to perform a number of actions including moving the focus point, taking a picture, browsing through the menu and more. Also worth mentioning is that the S1 benefits from an extra status LCD screen on the top plate which displays all the most important shooting information. It can also be illuminated in poor light conditions. 5. In-body stabilisation and Dual I.S. Both the S1 and GH5 use Panasonic’s 5-Axis Dual Image Stabiliser 2 (Dual I.S. 2) to stabilise hand-held stills and videos. It combines lens-based O.I.S. technology with sensor-shift stabilisation inside the body. When a lens equipped with O.I.S is mounted, the lens corrects for two axes of motion, whereas the in-body stabilisation system compensates for five. Without a stabilised lens, the camera still compensates on 5 axes. The difference is that the S1 increases the level of compensation when Dual I.S. 2 is employed. Whereas the GH5 provides 5 stops of compensation regardless of whether you mount an optically stabilised lens or not, the S1 provides 5.5 stops with 5-axis Body I.S. or 6 stops with Dual I.S. 2. Of course, these numbers are based on the CIPA standard, and real world results may vary depending on the lens used and how stable you are. An interesting addition to the S1 is I.S. Status Scope. By displaying a graphic interpretation of vibration on screen, it helps the photographer understand tell how much he or she is shaking. The S1 has inherited the GH5’s contrast-based autofocus system which Panasonic calls Depth from Defocus, or DFD for short. They share a number of the same focus area options – 225-Area, Custom Multi, Single Point, Tracking, Face/Eye Detection and Pinpoint – but the S1 gains two interesting additions. The first is called Advanced Recognition Technology. In addition to being able to recognise faces and eyes, the camera is also capable of identifying human bodies and animals (cats, dogs and birds for the time being). We were pleasantly surprised to see that the camera had no trouble detecting and locking onto people, even those who did not occupy a large portion of the frame. When a subject is detected, a rectangle appears around him or her. If the camera detects more than one individual, you can tell the camera who to prioritise by pressing the AF Joystick. The same technique can be used to switch between faces or eyes of a subject. The second is 1-Area+ which expands the size of the standard 1-Area option to include the points immediately surrounding it. I found myself using it quite a lot during the press event, just as I do the Expand Flexible Point option on Sony cameras. The focusing system of the GH5 can operate as low as -4 EV but the specifications do not state at which aperture. The S1 by comparison can operate down to -6 EV at f/1.4. By combining the AF drive with a maximum read speed of 480fps, the GH5 can autofocus in up to 0.05 seconds which is a little faster than the 0.08 second acquisition time of the S1. So far, we’ve pointed out many ways in which the S1 outperforms the GH5 but in terms of burst and shutter speeds, the tables turn in favour of the Micro Four Thirds model. The GH5 can shoot up to speeds of 12fps (AF-S) or 9fps (C-AF) whereas the S1 can reach 9fps in S-AF or 6fps in C-AF. Switching over to the electronic shutter does not alter these speeds. To have a Live View of your scene, you must reduce the speed to 7fps on the GH5 or 6fps on the S1. And let’s not forget about the 4K and 6K Photo modes, which allow for the extraction of JPG stills from video footage shot in either 4K or 6K resolution. (It is essentially a form of burst shooting with faster-than-average continuous shooting speeds but no RAW option.) With 6K Photo, you can capture 18MP JPGs at 30fps whereas with 4K Photo, the speed goes up to 60fps but the resolution drops to 8MP. Then we have the maximum shutter speeds of each camera. Both have a maximum speed of 1/8,000s with the mechanical shutter but switching over to the electronic shutter allows you to push that speed up to 1/16,000 on the GH5. The mechanical shutters inside the S1 has been rated to 400,000 actuations, which is twice as much as the GH5. Both cameras can record 4K video up to 60fps. The S1 does this with a 1.5x crop, but uses the entire width of the sensor up to 30p. The GH5 can record in 10-bit 4:2:2 internally on the SD card (400Mbps maximum) up to 30p. At 50/60p, it is 8-bit 4:2:0. It can output 10-bit 4K 50/60p via HDMI. The S1 is limited to 8-bit and 150Mbps for now, but a future paid firmware upgrade will allow the full-frame camera to record 10-bit internally or via the HDMI output. Both cameras have a V-Log option to record more dynamic range, although it needs to be activated via a paid firmware (in the case of the S1, it is the same one that will also bring 10-bit recording). They have an HDR profile in addition to Like709 and many other video-oriented settings. The Micro Four Thirds camera has an additional 6K anamorphic mode that works at 24fps. In Full HD, they can both record up to 180fps. Below you can see some 4K compilations taken with the two cameras on separate occasions. Now let’s turn out attention to the design of the two cameras. Anyone who still believes that compactness is the defining feature of mirrorless products will be surprised by how much larger and heavier the S1 is than the GH5, which was already considered fairly large for a mirrorless camera. There are a few differences in terms of button and dial placement on the rear. For example, the S1 has a new button dedicated to changing the AF area whereas the GH5’s Display button is located on the grip. Both come with a focus joystick, a control pad, a Q menu button and a focus switch. On top, you’ll notice that the S1 has a single PSAM dial whereas the GH5 makes room for two: a drive dial and a PSAM dial. This is because the status LCD occupies much of the top plate on the S1 model. Both have a hot shoe for accessories, front and rear control dials (albeit in slightly different locations) and an array of buttons dedicated to settings such as WB, ISO and exposure. Both cameras offer a dual memory card slot. On the S1, one is for an SD card (UHS-II) and the other, an XQD card. 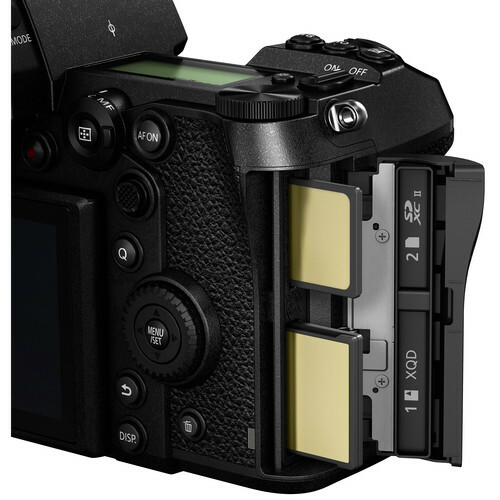 The GH5 only accepts SD cards, both of which offer UHS-II compatibility. As for the interface, both have a SuperSpeed USB 3.1 Gen1 Type-C port, 3.5mm headphone output and microphone input, 2.5mm remote input, and full-sized HDMI Type-A port. 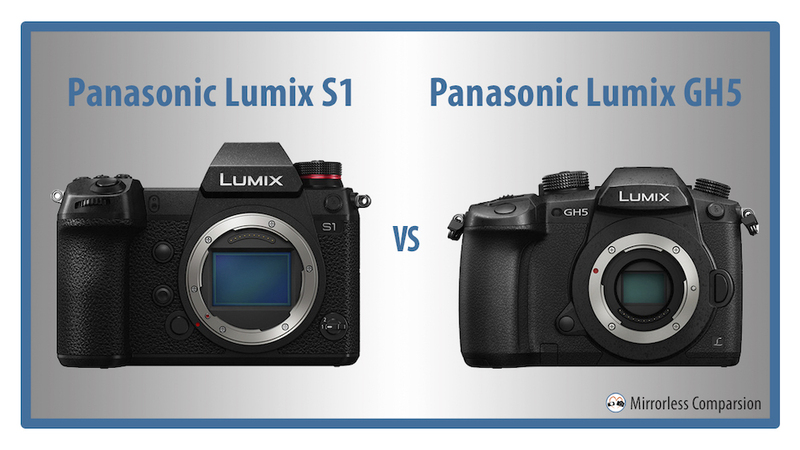 When comparing cameras from different brands, it is easy to fall into the trap of focusing solely on the camera bodies whilst ignoring the system as a whole. In the ten years since Micro Four Thirds first became a standard format, Panasonic and Olympus have managed to produce a complete lens ecosystem including both high-end glass and more affordable options. Many of them feature weather-sealing, a premium construction and excellent optical stabilisation. There are many options from third-party brands, as well as adapters (including focal reducer types). All these aspects combined make Micro Four Thirds the most versatile system on the mirrorless market. The L mount is relatively new, and despite Panasonic’s L-mount alliance with Sigma and Leica, there are currently only six Leica SL lenses and three Lumix S lenses. By 2020 however, we should see the range grow substantially. Panasonic and Leica have promised six / five more lenses respectively, while Sigma is planning to launch fourteen L-mount lenses along with an EF adapter. One of the biggest differences between the two Lumix models is, of course, the price. The GH5 can currently be found for approximately $1600 US (body only) which is around $900 less expensive than the launch price of the S1. Suffice it to say, the extra money spent on the S1 is mostly for the full-frame sensor and the features that go with it, such as the High Resolution mode and better high ISO performance for stills and video. And not to jump the gun but its quality looks very promising judging from our initial tests. The GH5 has remained one of our top three favourite mirrorless cameras since we tested it two years ago. The smaller sensor might not please everyone, and its dynamic range and high ISO capabilities certainly won’t reach the level of the S1, but as a whole, it is one of the most complete cameras we’ve ever reviewed. And even more important, it is really fun to use. It also has the widest range of features for video-makers and this is why it remains an extremely popular choice in this category.